Although I don’t eat it as often as people think I do (if I did, I probably could not get my arms over my giant, permanent, bacon-induced, food baby to reach the keyboard and type this post) I do like to try to find new ways to add it to recipes whenever I can and am always up for trying things with bacon in it. So when I saw WWDTM’s “Sandwich Monday” post about the latke double down, where the WWDTM team replaced the Jewish Journal’s version using lox, with brisket, I immediately thought, “Why didn’t they use bacon?”. Now I know that placing a pork product inside a sandwich created in time for Hanukkah (we actually made ours during Hanukkah) and written up in the Jewish Journal is probably sacrilegious, but just go with me on this. The Latke Double Down is based on KFC’s Double Down, a sandwich where the bread is replaced with fried chicken breasts. The Latke Double Down uses latkes as the bread of the sandwich. The Jewish Journal put lox and sour cream in their double down, instead of KFC’s bacon and cheese, and the Sandwich Monday team decided to use brisket. But I, of course, thought it would taste even better with bacon. Lucky for me I have a friend who loves bacon as much as I do and also likes to try new bacon-y foods. We get together every once in a while for a bacon-themed dinner, and for our last bacon night, we decided to make our version, a Bacon Latke Double Down. Now for our Double Down, we did not just use any bacon. We pulled out all the stops and used Hungarian double smoked bacon. 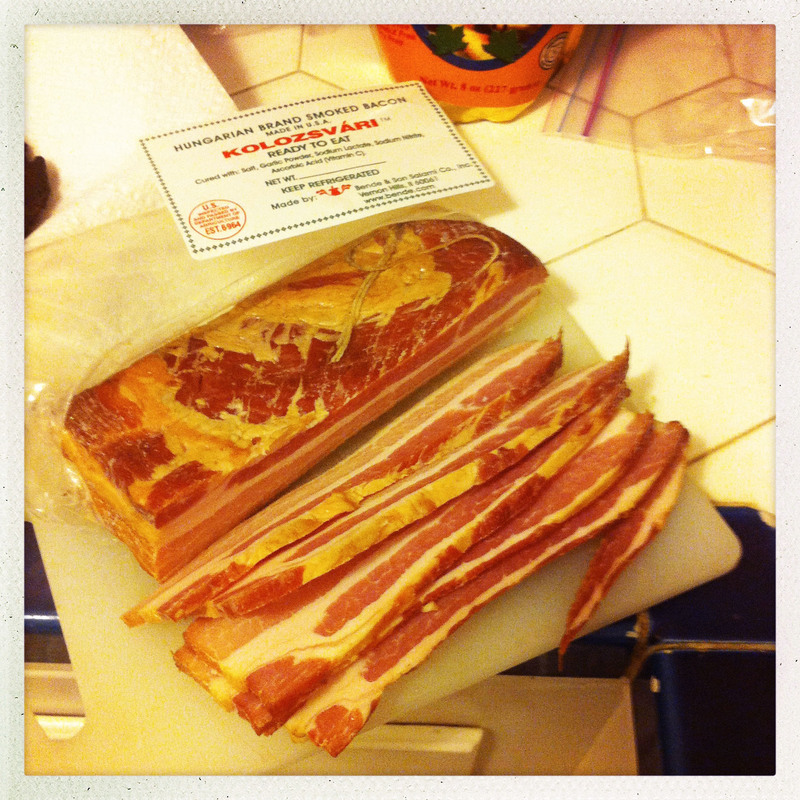 Double smoked bacon is smoked longer than regular bacon, is fattier and comes in a slab with the rind. One of the ways Hungarian double smoked bacon, or szalonna, is traditionally eaten is on rye bread. The szalonna is cut into pieces, skewered and cooked over a fire. As it cooks and the fat begins to drip, you hold the szalonna over the bread to collect the drippings. You can put vegetables on the bread and then the cooked szalonna on top. Those Hungarians sure know how to eat their bacon! 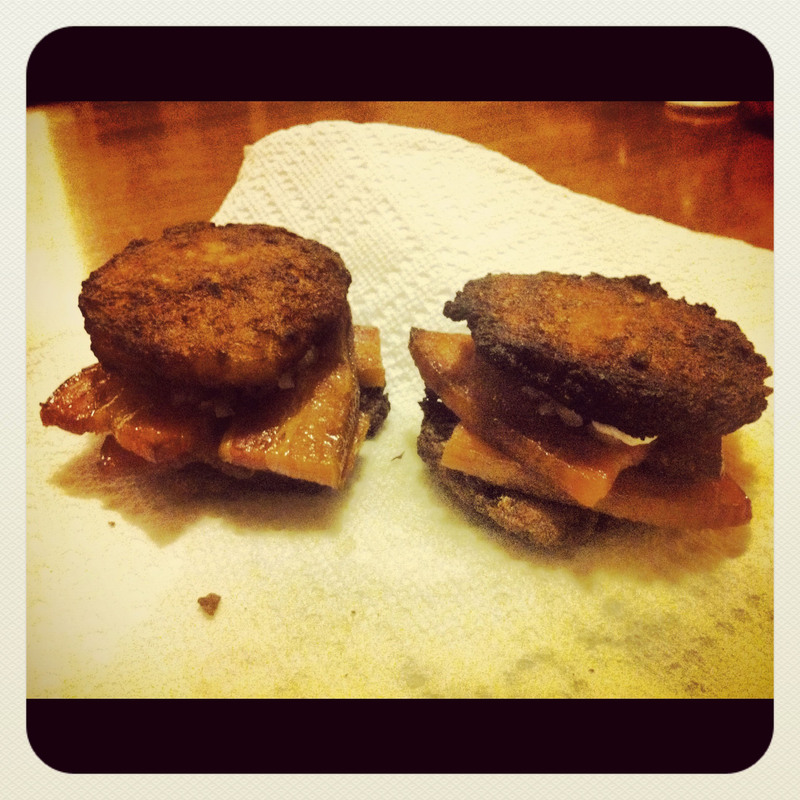 To make our Bacon Latke Double Downs, we made the same sandwich as in the Jewish Journal, substituting the salmon with bacon. We cheated a bit with the latkes and did not make them from scratch. To save time, we just used frozen latkes from Trader Joe’s. So our Double Down consisted of two latkes, each slathered with sour cream, pieces of cooked szalonna (we cut ours into slices) and onions. 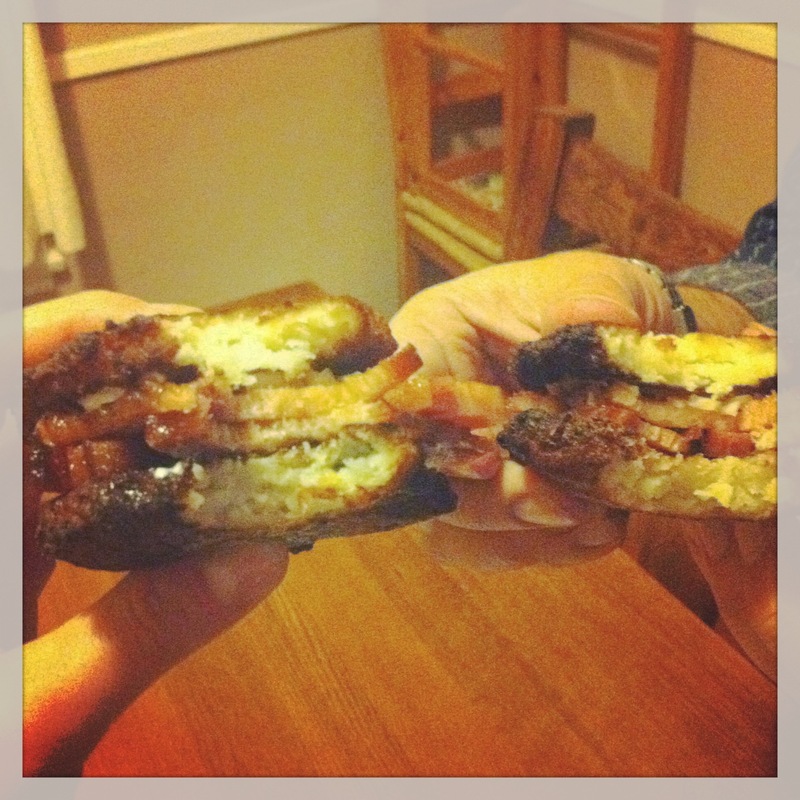 Our Bacon Latkes Double Downs were delicious! But I guess that’s not surprising since bacon makes pretty much everything taste better. This was the first time I’ve ever had Hungarian double smoked bacon and I have to say that it was amazing! Probably the best bacon I’ve ever had. I am certainly going to find other recipes and dishes to add it to. 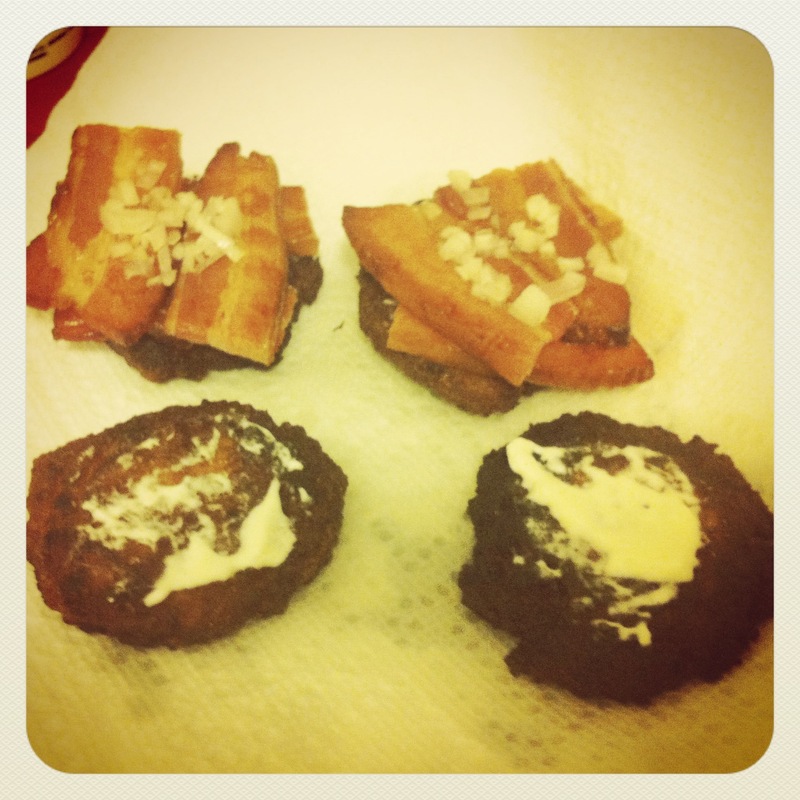 For our bacon-themed dinner, we didn’t only have the Bacon Latke Double Down for dinner. It truly was a “bacon-anza”. We also had crackers with maple-bacon butter, cheddar bacon popcorn, “Loaded Bacon and Cheddar Potato Skin” flavored Ruffles, bacon-wrapped crackers, and the bacon explosion. My cholesterol levels still have not returned to normal since that night.